Making good on an earlier pact, Cisco Systems and Apple have begun to explore ways in which their respective iPhone devices can work together. The two firms ended a fiery dispute over the "iPhone" trademark back in February, avoiding legal proceedings with out-of-court settlement that granted each company the right to use the name on its products. As part of the agreement, Cisco and Apple also agreed to investigate opportunities for interoperability in the areas of security, and consumer and enterprise communications. Already there are about a half-dozen ideas on the table, according to Cisco Chief Development Officer Charlie Giancarlo, who revealed in an interview last week that Apple Chief Executive Steve Jobs is discussing with members of his team ways in which to make the Apple iPhone compatible with Cisco's business and consumer equipment. "We're optimistic, but it's still early," said Giancarlo, adding that ways in which the companies' products can work together "are now being investigated by both technical teams." The discussions, however, aren't centered on making Cisco's iPhone, an Internet-based home phone, compatible with Apple's wireless device. Instead, Giancarlo said Cisco wants Apple's iPhone to work with its corporate phone systems, allowing users to get the same services, such as instant messaging and teleconferencing, on their Cisco desk phones and Apple iPhones. Apple has said it will begin selling it's iPhone handset by the end of June. Cisco's vast array of iPhone branded devices were introduced back in December. Bummer Cuz that's probably the way the owners of the iPhone would get best use and value out of the freekin ~$500 phone. Thanks to Apple selling out to Cingular, we may never see free wifi features on the iPhone. It's like they just want to oppress the consumer all the way. Yeaaaaaah, because that's what Apple has been about up until now. Wait until the unit ships, ferchrissakes. What? This is great news. One of the biggest issues with the iPhone is how well it will work in a corporate environment, and this is going to help a lot. I think you've misunderstood. Making the iPhone compatible with Cisco's systems is exactly the kind of thing that makes voice over Wifi IP closer to a reality on the iPhone. I don't doubt that someone will find a way to get VOIP on them eventually, and then I will find it VERY hard to resist (maybe even pay the cingular cancellation fee as soon as I sign up, just to get this sweet device). Of course, I'll also want to experience how reliable the keyboard software is first, I have my doubts. Sounds like Cisco is very excited to jump on the iPhone (Apple's iPhone) bandwagon. Apple typically wants to run the show. I don't see anything coming of an Apple/Cisco partnership. "If you don't let me use the 'iPhone' brand name then I will hamstring the Apple iPhone by not allowing it to interoperate with your business and consumer equipment. And that's a threat, mistah!" Some threat. Even CEOs of billion dollar tech firms can't escape Jobs' RDF. Just as we all expected, it has been comfirmed that the only reason Cisco released an "iPhone" was to ride the coat-tails of Apple's iPhone. The two systems are completely different and I predict the only sort of "interoperability" that will arise is the ability for the Apple iPhone to call a Cisco iPhone... and vice versa. It's strange that this guy is talking about it. Perhaps he doesn't know about Apple's policy of not talking until they have a marketing strategy plan. Hard to think that Apple will NEVER innovate again. What IS a person to do? So your saying Apple doesn't have an iPhone market strategy. This is a very good thing. One problem that has been stated with the iPhone is it's inability to work with corporate networks. If this will resolve that problem, then it opens up the door to significant sales. All Apple needs now is to get its "push" email service on a secure network, ala Blacberry, and it will see those sales. Perhaps this will will help that as well. That's obviously what he's saying. He pulled that from the place I guess he thinks Steve pulls Apple products. And so we can conclude he hates Apple. I believe what we will see is a Cisco IP phone that is designed by Apple and runs embedded OSX. It will do away with the myriad buttons and will simply have Apple's intuitive user interface and multiTouch screen. It will be marketed by Cisco to enterprises at first. Later Apple will sell a similar unit geared toward consumers. I think you've misunderstood. Making the iPhone compatible with Cisco's systems is exactly the kind of thing that makes voice over Wifi IP closer to a reality on the iPhone. I don't doubt that someone will find a way to get VOIP on them eventually, and then I will find it VERY hard to resist (maybe even pay the cingular cancellation fee as soon as I sign up, just to get this sweet device). 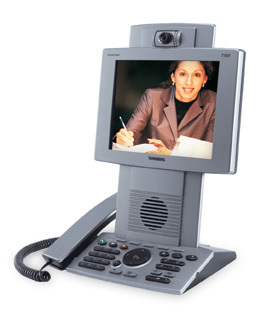 Cisco makes much more than consumer Skype-phones. They also make back-end equipment, allowing you to set up a corporate PBX system entirely over IP, with users only seeing a "normal" phone on their desks. Interoperability with this would be great. If a corporation sets up some Wi-Fi base stations attached to the same LAN as the phones, it would be nice if an iPhone could join the network and place/receive calls. Even better: what if you could receive/place a call on the LAN, and have the handset automatically transfer the call over to the cellular network when you walk beyond the range of the Wi-Fi base stations? Or vice versa - where you're talking on a cell call and it transfers to the VoIP network when you arrive at the office? Getting this right is not easy (think about what has to happen when the root of a 6-way conference call transfers between cellular and VoIP...). Cisco has been doing R&D on this for a while now. It would be wonderful if Apple's iPhone could be the first cellular handset to work with this system when they're ready for commercial deployment. Sorry, but Apple's not licensing OS X to anyone. And how does moving the buttons to the screen vs. on the keypad somehow make it "easier"? If you've got the same buttons, you've got the same "ease-of-use" (or lack there of). Of course, we could also wait for the iPhone to actually be released before we proclaim its UI to be intuitive, as well as proclaiming the multitouch screen to be a life-changing screen and the bestest thing ever developed. Sorry, but I'd rather shoot myself than see Apple create a leviathan like that thing. Besides, I don't think Apple really seems like collaborating in enterprise products, especially intimately, and while involving their precious touch OS. I give your prediction a 2 out of 10. Second big belly laugh I've had this morning. Sorry, but Apple's not licensing OS X to anyone. This isn't your grandmother's Apple "Computer" Inc. we are talking about anymore. Steve is older and wiser and Apple isn't the same. The rules that applied 10, 20, 30 years ago don't apply anymore. And how does moving the buttons to the screen vs. on the keypad somehow make it "easier"? If you've got the same buttons, you've got the same "ease-of-use" (or lack there of). The elimination of physical buttons is better because the iPhone UI is context sensitive. On a traditional phone all the buttons are there all the time. On an iPhone only the buttons you need for the current context are present. Or you could watch the demonstration videos on their website. Or you could read the reviews from any one of a dozen journalists who have actually used it.